Released in Hungarian in 1985, Satantango, László Krasznahorkai’s first book, was translated into English in 2012. 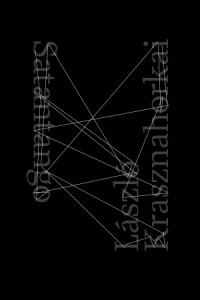 Published by New Directions, the novel displays the melancholy, bleakness, and long sentences that define Krasznahorkai’s other books (War & War, The Melancholy of Resistance, etc.). 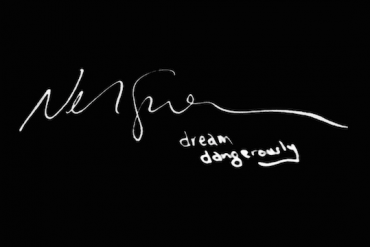 What follows is a collection of take-by-take notes on disc two of the film and the corresponding passages of the novel. (Notes on disc three are forthcoming.) Our time stamps are based on the Facets Satantango DVD (2008). Throughout the notes, we acknowledge differences between the novel’s content and the film’s content, as well as translation differences between the novel and the DVD’s subtitles. The novel demands much more—much more abruptly the first words of the chapter are “Turn the fire on!” This exclamation is surrounded by a description of buzzing horseflies and images of filth illuminated by light. In the film we meet the scene first via sound. The clock ticking. Loud, crisp footsteps. The clock continues to tick, setting the rhythm for the expansion of the space. Part of our view is obscured; we are behind someone, a third of the frame blackened by a large shoulder. The first words uttered are a suggestion: “You could light a fire.” In response: “I could.” Could is the key word here. Everything seems tenuous, the clock’s ticking creating an atmosphere of uncertainty. Yet the tension it produces is also concrete: the bottle opening, the footsteps, the clarity, the crispness of these sounds is presentness. A single light lights the details of the space: objects gathered in the back of the room, dingy. When the subject returns, the camera moves behind his back so that the entire frame goes black for a few seconds; then it emerges on the other side to gaze at a glass bottle. The details in the bottle’s reflections are immaculate. He pours a drink. We watch the movement of the liquid inside, his dark arm, hand; everything else is out of focus. The ominous condition described in the novel becomes a series of statements: “Awful weather.” “It destroys everything.” “Look at this coat. This used to be as soft as butter. And now, it’s so dried out.” The weather becomes a cosmic entity, unavoidable, concrete, and abstract. In Damnation we hear what might be perhaps one of Tarr’s taglines, that all stories are about deterioration. Here too, everything is deteriorated or in the process of deteriorating. (This, though, is also the definition of life and growth. Once something lives, it also begins its slow journey towards death.) The weather destroys everything, yet it is a slow and natural process. This is the natural pace of things, the pace of the weather. “You’ve been saying this for years.” The implied repetition is like a gradual chipping away. Everyone here is weather-worn. “They wash your organs night and day.” These forces are both internal and external. The consistent pattern is that of constant wetness and drenching into sudden drying out. When things happen too quickly it can be fatal. When they happen slowly, the end is still inevitable. Then, here, the camera lingers on the scene even after the character leaves. Is the camera indifferent to him? Or generous in its willingness to wait for his return? What is the camera’s stake in all of this, in the characters? What is the camera’s outlook? Camera is pointed at the door now, positioned behind the bartender’s head. The driver, Keleman, enters. He’s soaked, and there’s the sound of thunder outside. The camera pivots right as Keleman comes closer. To the barman, whose head is partially shown on the right side of the frame, Keleman announces the arrival of Irimias and Petrina—one of Satantango’s promise-and-betrayal trajectories. Resurrection itself is a return, a fragment of the circle. Clock sound again. The bartender is incredulous; he shakes his head. Camera moves in on Keleman’s face as he recounts and partially embellishes the encounter with Irimias and Petrina. Barman’s angry face as camera recedes: behind Keleman’s shoulders, across bar floor, past Kerekes. The two men stare wordlessly at each other over the bar. Ambient drone, clock. Clock grows louder and has a pronounced echo, a rebuking tick that reminds us we are watching for solitude and time, not for identification. Store room: barman enters, holding a sandwich. He starts eating the sandwich, then throws it. Camera drifts with his movements. He has a tantrum, screaming “Irimias and Petrina,” etc., and clubbing things. Seems he feels he will need to defend the bar from Irimias and Petrina. He stops the smashing and closes his eyes. After focusing on his face for a few seconds, the camera moves back to its original position and stays still as the barman sweeps up the bottles he’s broken. He brushes off sandwich and eats it. Beckett is in this scene. One perspective is that these characters have all the time in the world. Another is that there is not enough. Here again the clock ticks loudly in background, reminiscent of the scene of Irimias and Petrina waiting in government building, but also a constant reminder of the constancy of time. The texture of the glasses even becomes a measurement of time. The characters constantly judge each other but are unable to turn this criticism inwards. The camera eventually moves to show hands, then blackness, then reveals Mrs. Schmidt, who has arrived with her bag. The novel gives us much of her inner dialogue, desires, words, yet here we can only stare at her face. The movements in this scene are slow and deliberate, the way she looks at the landlord to indicate her mental state, the way his hand sets the glass down slowly. She takes the drink quickly though. After her drink, a slow contemplative moment while we hear the others continue to talk in the background. The camera slowly pans inwards onto her face. Her expression barely changes but the subtle changes seem to tell a narrative, the soft movements of her mouth, the lines around her eyes, her wet hair, barely blinking, forlorn. The closer the camera gets to her face, the more tragic this face seems. When the camera finally stops and lingers, her face seems incredibly still though it has been still this whole time, only the camera and our gaze had been previously moving. Then, she gets a whiff of something. Esti is perhaps the character who asks for the most complicated but most readily given empathy. In the film, the long shots of her often distorted or dumb-looking face contrast against the long and tedious passages in the book that illuminate her thoughts, desires, memories, intentions. In the film, the shot starts with the camera positioned behind Esti’s shoulder, staring at the house (which is in a complete state of disrepair—walls crumbling, bricks out of place). The door opens and it is Sanyi. Without any words, the two walk away from the camera, and continue walking. In the book, this scene seems very “loud,” as Esti’s interior monologue shadows all actions. But in the film, the camera remains still and there is very little sound. A dog runs by behind the house. The two siblings continue walking outward until they are tiny dots. The dog appears again and runs after them. Three dots getting further away. We see the largest dot, Sanyi, shoo the dog away. The dog comes back, close to where we (the viewers) are, back to where he came from. The other two dots keep moving. Handheld camera, ostensibly first-person POV. We move toward Esti and Sanyi in a thinly wooded area. Sanyi is digging. He stops and tells Esti to give him her money. They kneel and wrap coins in a cloth as Esti obediently removes them from her coat pocket. Sanyi ties up the cloth and they both fill the hole back up with dirt. “Are you sure the moneystalk starts sprouting in four days?” Esti asks. “Sure,” says Sanyi, “but only if you give it enough water every day.” Esti asks if the money tree will make them rich and envied. Sanyi assures her it will. He hands her the shovel and tells her to take it home. She runs off with it. The money tree implies another promise, which, to us, already appears to be no good. About a sixth of the frame is sky, and the rest is a muddy field. Esti is running toward us holding shovel. As she comes closer, the camera turns with her. We follow her as she walks parallel to her house and leans the shovel against the wall. She’s winded but focused. She sits down in an upholstered chair, staring out at the field, thoughtfully and maybe wistfully. We’re now looking over Esti’s shoulder. Kerekes enters the frame from left and knocks on the door. A woman—Esti’s mother—opens the door and lets him in. Camera drifts with Esti as she gets up and looks through the door’s window. Her mother opens up the door and tells her to stay seated and stop snooping. Camera stays on closed door. Esti is sitting still, staring straight ahead, behind the camera. She does not move but her dress, sweater, and hair all flutter in the wind. We can see her breathing, blinking. Her feet don’t touch the ground and are very still. The textures of the wall behind her resemble an abstract painting. Eventually she gets up and the camera follows her as she walks away, against more varying textures. She turns the corner, the edges of her sweater still fluttering. Then she climbs up into a small opening. Inside, it is dark. Esti’s special place perhaps. She sits by the opening, which overlooks the front door of the house. We can glimpse the familiar images outside: light. Inside: dark and the textures of her sweater, lace. She picks up a white piece of lace, carefully and purposefully folds it, and wraps it around herself like a shawl. Is she cold? Or is this a form of posturing, a costume? The camera slowly peeks around the edge (is this Esti’s point of view or ours? Are we cheating here? Is the camera moving independently? Or are we following Esti’s gaze? ); the melancholy and wet landscape sits framed like a painting. A most creepy image: Esti’s face, serene and calm, lips pursed. She is sitting with the cat in her lap, purposefully and softly caressing it. Esti’s face is blank; she stares straight ahead, her face boyish and dumb. There is purpose behind those strokes, purpose behind those pursed lips. The camera is behind Esti, who is humming. Then the cat runs away and the humming stops. Esti gets up and walks out of frame toward the cat. What follows is an initiatory challenge for the viewer. After crawling, climbing, and ducking through rafters, Esti finds the cat and grabs it, saying, “You’ve made a mess in your pants.” She holds the cat up by its front legs, stares into its face, and shakes it. “How do you have the nerve?” she asks the cat before dropping it. Has the cat really had an accident? Or is Esti playing a perverse role-playing game using her mother’s vocabulary? Esti picks the cat up, holding it by its forelegs again. This time, the cat’s ears are flattened; it is visibly afraid and growling. Esti says, “I can do whatever I want to you.” She falls to the floor with the cat, rolls over with it, and says, “I’m stronger than you.” She rolls more. Dust rises and the cat whines. “You’re dead,” Esti says. “I won’t feel sorry for you.” She stops rolling and sits up. She shakes the cat as if it’s not responding properly. The framed scene outside: gray and gloom and wetness and rain, the sound of the rain and the wind and the weather. We can still hear the cat’s crying in the background. We focus on Esti’s back as she puts the cat into a net. This, perhaps, is very difficult to watch. Difficult because we feel for the cat, an innocent and helpless animal at the mercy of a little girl? Or for Esti, whom we also empathize with? In her mind, these actions are necessary, perhaps. The cat dangling, trying to escape, futile. Its cries, our cries—both are painful. The cat struggles and becomes more tangled in the net. Outside, the sound of rain. The textures of a wind-worn world, all the textures of decay and deterioration. Esti is leaving. It is cold, so she pulls the lace over her head. She goes inside the house but the camera lingers a bit longer outside, just watching the building, listening to the rain. Esti is washing her hands, dries them. We watch her; the camera subtly pans as she moves around, in and out of the frame. She is tip-toeing so as to not make too much noise. Sometimes the texture of a door is as significant as the texture of a person. Esti pours milk and powder in a bowl, stirs the mixture with her index finger. She stows the powder in her pocket as she leaves the kitchen. Camera drifts toward the door, which Esti has left open. Heavy rain outside still. At the money-tree site. Sound of wind. Esti walks toward us carrying the stiff, slain cat in her left hand. When she sees the hole has been emptied, she gets on her knees to inspect it. Stunned, she stands, runs away, and becomes tiny as she moves away from the camera, across the field. Esti is running towards us; the ground is dark and heavily textured. She runs to Sanyi in a panic. He reveals that he took the money. He “needed” it. Esti is still holding the dead cat in her arm. She begins to run away but he calls her back. He does not notice the dead cat, but pulls out the rat poison from her pocket. She walks away slowly, blank-faced, the same way she came here: down the dark and textured path. Trees, like in an old photograph or painting. So many tall and vertical lines that seem to blend together, blurring into a wooded forest. Esti walks toward us, soaking wet and still carrying the cat. We can hear every step she is taking. She bobs up and down as we follow her walking. A tiny light off in the distance surrounded by almost all black. Music. Esti enters the frame. It is dark. We can barely see her. She walks toward the light. For a moment she disappears into the darkness. The sound of the rain drowns out the faint music. All we can see is the light, a very faint Esti approaching in the distance. Esti is standing in the rain, looking into the pub’s window. Inside, people are dancing rowdily to a repetitive accordion song. Strange, exaggerated behavior and almost slapstick movements. Esti is still at the window, but we see her from the side now. The doctor comes from the left side of the frame, and Esti runs to him, cat under arm. She seems to plead with him, but he pushes her away. He falls in the mud and struggles to stand up again. “What the hell do you want?” he asks. “Come on, tell me. What’re you doing?” The camera slowly pivots until it faces Esti, who looks shocked and hurt by the doctor’s coarseness. She runs off, with the doctor telling her to come back. Frontal tracking shot of Esti walking. She looks stunned and angry, but also determined. Shot dissolves. After a black fade-out/dissolve (this is rare), we see Esti still walking. It is day now, or light out at least. Her eyes are wide. She looks upset, distressed, shattered, sad, angry. She continues walking toward us. The camera tracks backwards. She still has the cat, who is rigid under her arm but perhaps still a little warm still against her stomach. It looks as if she might start crying, but she never does. Her steps become uneven at points. Are we meant to empathize with the camera here or Esti? A beautiful and very classically framed shot of an abandoned building with three archways that split the screen into vertical thirds. Esti appears in the left opening and then stands in the center one. Horizontally the frame is split into two sections, though the shadows and rubble seem to subdivide the frame further. Esti looks around. Is this where she will die? She exits the frame though the camera loiters. Esti leaves the structure and sits on the ground, setting the cat down. The camera moves closer as she pours poison into her hand and puts it in her mouth. She lies down with the cat on her chest—a strange and incongruously tender gesture. Voiceover from novel. Voiceover continues. Camera is stationary, facing the front of the structure. Strange, fake-looking fog crawls by. She laid Micur down on her right, and once she had divided the remaining contents, brotherly fashion, half and half, and had succeeded in swallowing her half, with a little rainwater to wash it down, she placed the paper bag on her left side on a rotten board, because she wanted to be sure her brother wouldn’t miss it. She lay down in the middle, stretched out her legs and relaxed. She brushed the hair from her forehead, put her thumb in her mouth, and closed her eyes. No need to worry. She knew perfectly well her guardian angels were already on the way. The characters are squeezed into the left half of the frame, all the action happening on this side. We can not see the character whose voice we can hear most loudly: “I was just plodding and plodding, and plodding along.” The right half of the frame is black, a wall. The camera then pans over to follow the bartender who disappears behind a door. Then a figure enters the frame from the right, counting money. The door opens and the bartender comes back out. This all plays out as if it’s been carefully choreography, and it seems to represent a strangely organized clumsiness, a poised and graceful chaos. The camera pans over and finally reveals Keleman, who has been talking this entire time though no one seems to be listening. The camera continues to pan back and forth to reveal different characters, drinking, counting money. “As you plod along, you learn everything,” says Keleman. In the book, though, we don’t sit with Keleman’s annoying voice. Instead we enter Futaki’s thoughts. The camera is very active in this scene, though the characters (with the exception of Keleman) are very inactive, slow; their movements seem momentary, inconsequential. Keleman will not stop talking. The camera movement coupled with the characters’ seemingly unplanned but very planned movements, like a dance, are reminiscent of the opening sequence of The Werckmeister Harmonies—a strange dance, the plodding, plodding along represented in this slow, futile dance. A loud voice. The bartender moves into the center of the room and the camera backs up to reveal the entire room. All faces are looking at the camera, at us, ready for a photograph it seems, but really they are looking at whoever might be right behind the camera. The door opens. It isn’t anyone of consequence—just Mrs. Horgos. They continue talking, plodding, plodding along. Her face is a good example of the kinds of faces Kovacs talks about, faces that seemingly have lines, history. “And plodding, plodding, plodding,” says Keleman. “Plodding and plodding and plodding,” says Keleman. Stationary shot of front of pub. Heavy rain. On the left side of the frame, Futaki is vomiting as a pig enters from the right. The barman opens the door, walks out, and stands at the top of the steps. Neither man speaks; the only sounds are the rain and the pig’s grunts. The barman suddenly steps down, takes Futaki by the shoulders, guides him back inside, and closes the door. The camera stays put for several seconds as the pig goes on shoveling its nose around in the mud. In the store room, the barman hands Futaki over to a chair and scolds him for drinking excessively and going out in the rain. Futaki, shamed and drunk, sits with his right side to us; his face is mostly blackened by the light behind him. The camera moves to the left, following the barman as he fills a steel bowl with water. Then he fetches Futaki and pushes his face into the bowl, telling him, “Wash your face.” Futaki splashes himself and then dries his face with a towel that the barman has given him. He then pathetically asks for food. The barman offers milk chocolate and cheese rolls; Futaki asks for two of the latter. We stay with him as the Barman exits. When the barman comes back, he has the requested rolls. He sits on Futaki’s left. Examining the bread, the barman says, “Bloody hell. What can’t be moved, they soil. [They] foul everything. I could spend my whole life following them with a cloth. The legs of the table, the window, the stove…the crates.” Leaning in to Futaki, he whispers, “The worst part is that you can’t see them do it. If I start to watch them, they can feel it.” This is one of the film’s most comical moments, but it also points us to a central symbol: the spider. The camera drifts to the right as Futaki shifts the conversation, saying, “The real threat comes from under the ground. Suddenly, one’s frightened by the silence, doesn’t move, crouches down in the corner where he feels safe. Chewing becomes pain, swallowing, agony.” The camera moves past boxes, etc. Futaki continues, “Then all slows down and finally comes the most terrible thing, a standstill. There’s no way out. Who can understand? I could live till the end of time, but I have to go down to that hell of dark mud…. But there’s Irimias coming….” The camera has circled around to face Futaki. The barman angrily says that Irimias has wronged him. Irimias, he says, gave him an idea to plant onions (to sell, presumably) and then enjoyed free drink as remuneration. After shaking Futaki, he cries, “There will be order here one day. There will be order!” Irimias’ arrival will sever one thread and create a new one. There is always a circle; things are always “connected up.” And order can only exist within this web; we know this from the scene with the officer. Perhaps one of the most famous shots of the film. Loud accordion music as we see the characters jolly, drunk, dancing. A spectacle of fools. A mesmerizing long take, but also strange, awkward, uncanny. Their movements are slightly off. A bit too repetitive perhaps. A bit too clumsy. Are they dancing or plodding? Here we return to Esti’s face as she emptily stares into the bar’s scene through the window. She is noticed by no one. The camera is at the edge of a table facing a bitter-looking Mrs. Halics. Between the camera and the woman there are empty glasses. Kelemen is still talking. The woman falls asleep as the camera moves left. Schmidt is asleep at the left side of the table. The camera continues moving left. Keleman’s off-screen ravings stop. We pass by the accordionist at chest level and then see Mrs. Halics and Mr. Kraner erotically chewing a piece of bread together. The music stops and the camera arrives at another table. A leak in the roof is dripping rain on it. The camera is positioned at waist height at the back of bar, facing the front. The patrons are slumped and silent. Even the barman is asleep at the bar. The accordionist stands and finishes two orphaned glasses of beer. He walks to another table and finishes two more, then visits another table for two more. He walks toward the camera. After he passes by us, there is the sound of vomiting. Voiceover: “That was all.” The accordionist reenters the frame from the left and sits down just in front of the camera. He begins to play the melancholic tune again. The camera slowly moves behind the accordionist’s back and blackens the screen. He stops playing, and the camera halts on his right side, at the edge of a table. Voiceover again: “And for the tender sound of an accordion, the spiders in the pub launched their last attack.” The narrator goes on to describe the spiders’ work, which leaves all things in the pub—tables, chairs, bottles, even the patrons—webbed. Then, the narrator says, the spiders “hurried back to their hiding place, waiting for an ethereal thread to move…to start it all again. 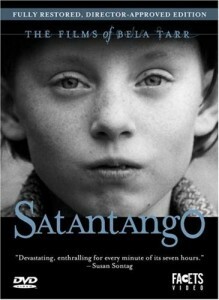 JARED WOODLAND and JANICE LEE are currently working on a book-length critical collaboration meditating on Satantango, both the film directed by Béla Tarr and the novel by László Krasznahorkai. Jared Woodland lives in Los Angeles, where he is at work on a novel whose preoccupations are animality, narrative, and the Midwest. 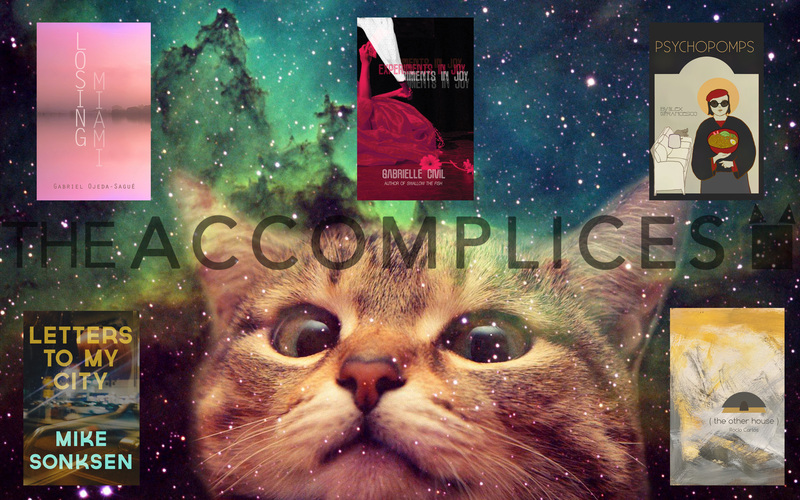 Janice Lee is the author of KEROTAKIS, Daughter, and Damnation. 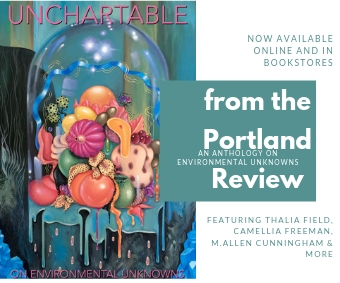 She is Co-Editor of [out of nothing], Reviews Editor at HTMLGIANT, Editor of the new #RECURRENT Novel Series for Jaded Ibis Press, Executive Editor at Entropy, and Founder/CEO of POTG Design.